This is an unforgettable experience. 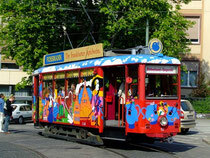 With the "Apple wine express", an historic tram, you will visit Sachsenhausen, see the old town of Frankfurt, the fair, the zoo and much more. 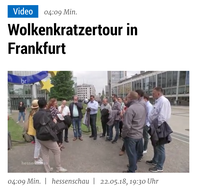 It is a very pleasant, traditional way to explore the city, accompanied by moderation, music and pretzels. The Ebbelwei-Express is ideal for all types of events and private parties e.g. birthday, anniversary, wedding or company outing.